In a world where everything has more possible explanations than ever before, where no experience seems real unless it is refracted, this book examines love, loss, and time itself under a variety of lenses: these poems are made from other poems, from paintings, from songs, from spam emails, snapshots, jokes, dreams. We are the experts on our own existence, but what does it all mean? 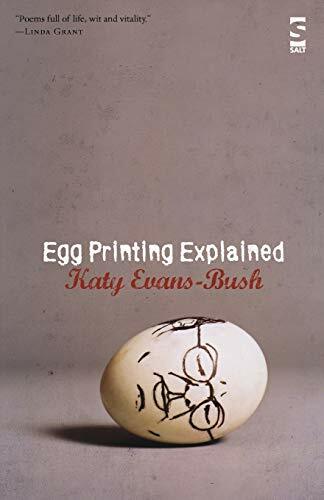 Katy Evans-Bush has been praised for situating poetry in the heart of daily life, and her second collection is written in deep engagement with the sounds and colours of real and imaginative worlds. The French writer Nerval's pet lobster takes us on a vibrant summer's outing in nineteenth century Paris. Two playwrights in two centuries ponder happily on their unseen downfalls. A child dithers on a hot day, and a lover resorts to pure tactile expression at the moment it means the most. A sharply-lit American childhood is seen as if through a telescope, from amid the mists of London and its layered lives. Ordinary objects act of their own accord; art speaks to us more than the person standing beside us; and the core of love remains the same while everything around it shapeshifts. One thing is certain, though: an egg is never just an egg. Katy Evans-Bush can tell an offbeat story the way you’ve never heard it before, but wanted to. Her ironised yet romantic fatalism--reminiscent of a post-sisterhood Millay--is a model of wit and restrained emotion. This intimate voice, in this accomplished collection, points to an unbridled versatility. Many of these poems are a tour de force. This is not to suggest in any way we employ the term surreal to describe Egg Printing Explained. These are carefully managed poems, never experimental in any formal sense, yet the poet is evidently nourished by a ludic spirit which allows for a collision of registers, a promiscuity of styles, and boundless performative verve.